The shirt, produced in Turkey, was sold in the Spanish retailer's Albanian, French, Israeli and Swedish online stores. It was removed on Wednesday hours after it went on sale. 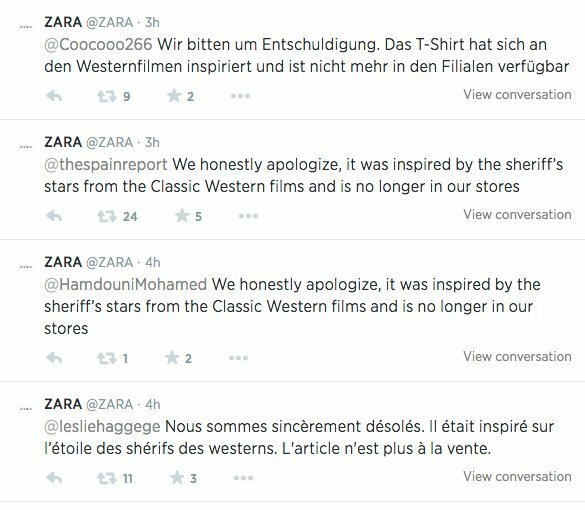 The retailer, owned by Spanish giant Inditex, flooded Twitter early Wednesday morning with multilingual apologies, insisting the garment was modeled on cowboy sheriffs of the Old West, not on the uniforms Nazis forced Jews to wear in World War II concentration camps nor the infamous yellow stars that Nazis forced all Jewish people to wear in and outside the camps. "Zara has issued a heartfelt apology on its social network profiles," Inditex said in a statement sent to The Huffington Post. "The items will be reliably destroyed." The company said sales of the shirt "have been marginal." Zara remained mum about the controversy on Facebook, where some of its 22.4 million fans posted comments lambasting the company for its insensitivity. 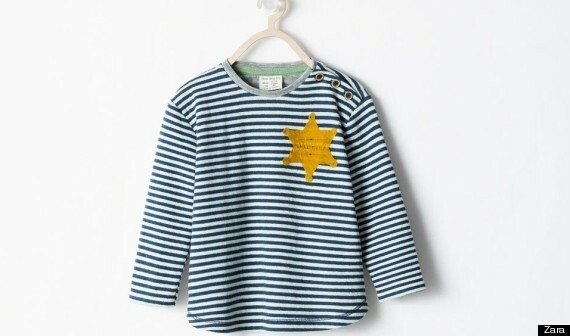 This isn’t the first time Zara has been accused of anti-Semitism. In 2007, the company was forced to withdraw a $78 handbag after a woman in Kent, England complained in the Daily Mail it was embroidered with Hindu and Buddhist symbols that resemble swastikas. The bags were produced by a supplier in India. But, amid a recent uptick in anti-Semitic violence around the world in response to the war between Israel and Gaza, many found the company’s excuse tonedeaf. The fact that the shirt was stitched in Turkey, which has engaged in saber-rattling with Israel under the rule of now President-elect Recep Tayyip Erdogan, only salted the wound. Later on Wednesday, the ADL welcomed Zara's swift apology and removal of the shirt. "This is not the first time we have seen a retail clothing company make this same offensive mistake," Abraham H. Foxman, the group's national director and a Holocaust survivor, said in a statement. "The fact that this keeps happening shows that there is a serious need for education about the Holocaust and the history of anti-Semitism."